Luscious and moist – a delight to the tastebuds! I just love the taste of fresh strawberries in this season! So even though I had already prepared the date walnut cake for dessert, I decided to make chocolate dipped strawberries. 1. Pick strawberries which are firm, bright and fresh and wash them well. Dry them and make sure that they are at room temperature. 2. In a microwave safe bowl put in the chocolate chips and heat for a minute in the microwave. If needed, put the bowl back in the microwave and check after 10 sec and 20 sec intervals. Remove and stir and make sure that the chocolate is completely melted. 3. Hold the strawberries by the stem/leaves and dip into the melted chocolate. Give it a twirl in the chocolate till the strawberry is partially covered. Shake it a little so that the chocolate fills all the grooves and is even. Remove it from the chocolate and twirl in a clockwise motion to let the excess chocolate drip off. 4. Place strawberries on a cookie sheet lined with parchment paper and allow the chocolate to set on the strawberry. You can either leave it out for half an hour or set it in the refrigerator. 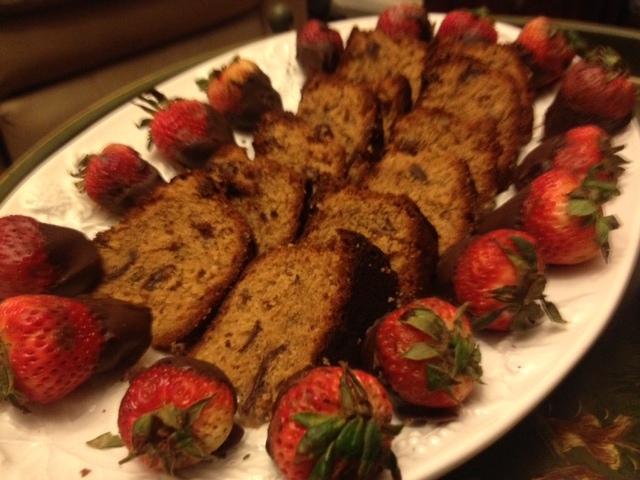 I placed the strawberries around the cake in a platter………A visual delight! This is one of my favorite cakes. It uses two ingredients which I love….dates and walnuts! It is rich in flavor and moist due to the fruit content. It is delicious and a great alternative to the Christmas cake. 1. Chop the dates and soak them in half a cup of water along with the baking soda overnight, or for at least 4 hours. 2. Sieve the flour and baking powder together. 3. Cream the oil and sugar well till light and fluffy. 4. Add the eggs one at a time and beat well. 5. Mix the dates and walnuts together. Alternately add with the flour to the egg batter. 6. Add vanilla essence to milk and pour this into the batter. Stir well. 7. Bake in a moderate oven at 350°F for 45 minutes or till done. 8. Cool and cut into slices.